Hello hello! Things have been extra busy around here, what with life and the half-bath remodel that I shared a few days back. And now spring break is upon us! So with all of that, I haven’t had a chance to share any new recipes in a couple of weeks. So I thought I’d reshare this fave from a few years ago. 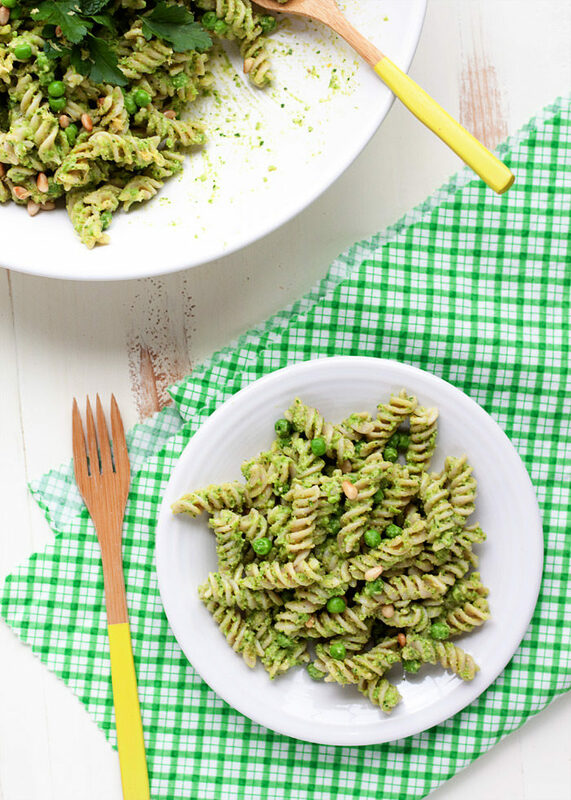 I adore this unique spin on pesto pasta salad, with peas in the pesto for a spring-y spin that also packs a surprising bit of protein. Perfect for potlucks and make-ahead lunches. Happy spring! At first glance, peas don’t seem like they’d be a great source of protein. They seem like a veggie – like any other veggie. Healthy, sure. But not necessarily protein-rich. One cup of shelled peas, in fact, has 8 grams of protein. Those unassuming, ordinary orbs are, actually, a bit of a nutritional powerhouse. Of course, there’s no time better than spring to celebrate all that pea-riffic goodness. 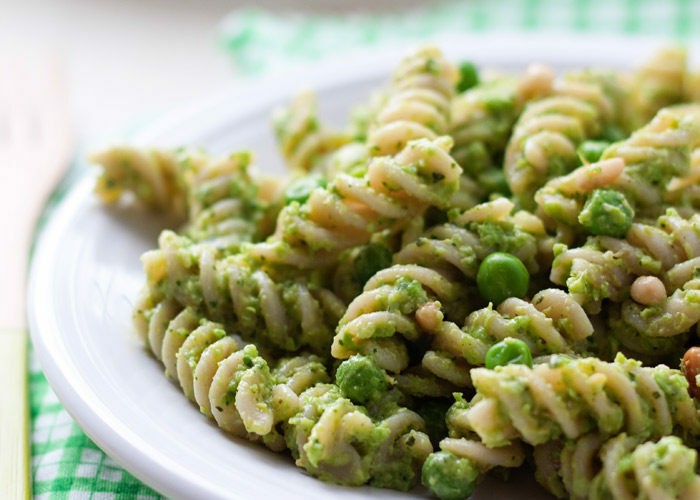 And this Pea Pesto Pasta Salad is full of peas. And P’s. So, pea pesto! Peas are a great way to bulk up your typical pesto, plus they add a nice sweetness and a bit of creaminess to boot. Not to mention that glorious green we’ve got going on. This particular pea pesto boasts peas (of course), parsley, fresh mint, toasted pine nuts, and a good squeeze of lemon. 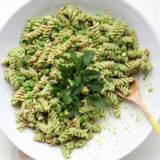 Tossed with a nice curly pasta, the pesto clings to every nook and cranny and makes for one seriously yummy pasta salad. Bonus: it’s vegan – and, if you use brown rice pasta, which I love in this, it’s gluten-free too. And, with all that protein, it can kind of work as a meal in and of itself. 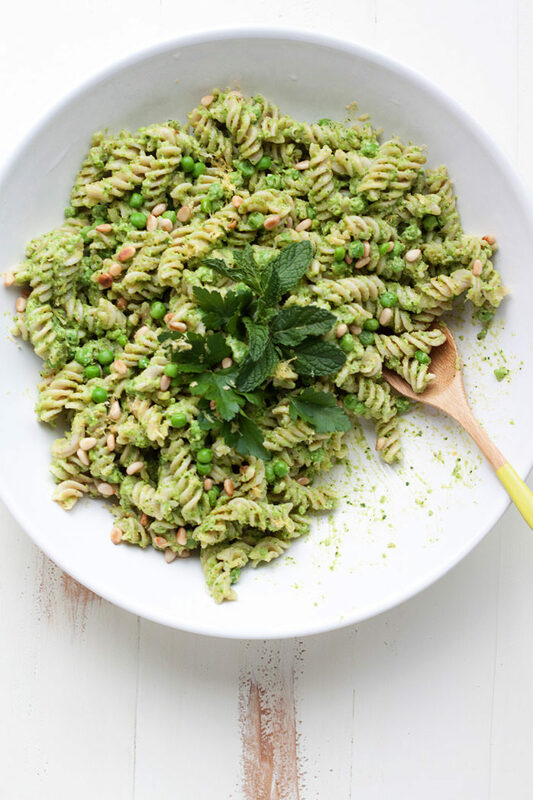 This easy vegan salad boasts a creamy pea pesto with parsley, mint, pine nuts, and lemon. Perfect for make-ahead lunches and potlucks. Cook the pasta according to package instructions. Drain and add to a large bowl. Let cool. While the pasta is cooking, toast the pine nuts. Place them in a large saute pan over medium-low heat and cook, stirring constantly, until fragrant and golden, 3-4 minutes. Remove from heat and set aside. Zest the lemon. Reserve zest for garnish. Set the lemon and zest aside. (You’ll top the finished pasta with the zest and use the juice for the pesto). Make the pesto. To the pitcher of a blender, add 1/3 cup of the toasted pine nuts, 1-1/2 cups peas, parsley, mint, garlic, 2 tablespoons lemon juice from the lemon you just zested, salt, and 1/3 cup olive oil. Puree until relatively smooth, adding more olive oil if necessary until the pesto is a saucy consistency. Taste and add additional salt and lemon juice if desired. Pour the pesto over the pasta that’s already in the bowl. Add the remaining peas. Toss gently until the pasta is coated and the peas are distributed. Garnish with remaining pine nuts, lemon zest, and a few sprigs of parsley and mint if desired. Serve. Can be kept refrigerated in an airtight container for up to 48 hours. Use brown rice fusilli pasta. Originally published March 14, 2016. Republished March 31, 2019.